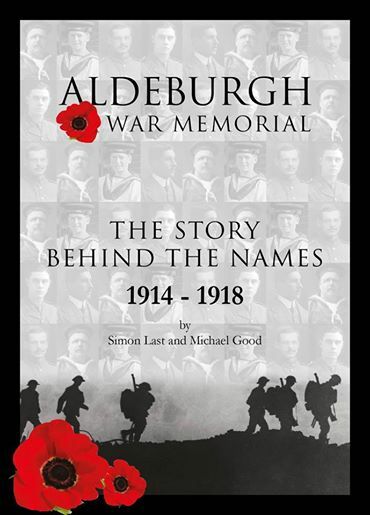 Genealogist Simon Last has produced a number of Suffolk ‘war memorial’ books, his latest being for Aldeburgh. It runs to 176 pages and provides full information about those who died in date of death order. The book builds on research undertaken by former Aldeburgh Mayor, Michael Good before he developed Alzheimer’s. The book is full of relevant information, such as newspaper reports when war was declared, wartime posters, images of the war memorial and other memorial plaques, photographs of the servicemen and woman (nurse) who gave their lives, details of their families, reports of battles, obituaries, probate information and much more. The last name in the book is Robert Kersey who died on 10 November 1918, one day before the Armistice. Remember to include your own postal address and state if you would like Simon to sign it or not.